Relax. The Sky Isn’t Falling. I haven’t weighed in on the current state of affairs in Taiwan in recent months since I have been busy with my regular job and since not all that much significant has happened. However, it seems that the rest of the world has a very different view of things than I do. I keep reading that President Tsai’s and Premier Lin’s approval ratings are sinking fast. Communications in the new government do not flow smoothly. The new administration has taken some shockingly conservative positions, bungled several appointments, and is basically on the verge of becoming a failed administration. Hey, relax! The world I see looks very little like that. Sure, Tsai’s new administration is going through some growing pains as it learns how to wield power. There have been a few missteps, but let’s keep a sense of perspective. These have been minor bumps rather than major failures that might define her first term. I think the biggest problem is that many deep green true believers are suffering from wildly unrealistic expectations. Did they really expect transitional justice to occur, economic transformation to be completed, KMT party assets to be recovered, the judicial system to be thoroughly reformed, and cross-straits relations to be fundamentally reset to Taiwan’s ideal position in just one hundred days? Maybe we should wait a couple of years before making our preliminary judgements. Also, maybe DPP supporters might want to enjoy the victories when they occur. The party assets bill is a good example of unwarranted hand-wringing. So the process was marked by stops and starts, with compromises, delays, and a fair amount of screaming from both sides. So what? That’s how the process works in democratic politics. The important thing is that the bill was eventually passed, not whether the government was sufficiently sincere, enthusiastic, or inflexible during the process. To roughly paraphrase a friend, recovering ill-gotten KMT assets has been a core DPP goal since before there even was a DPP. And now they have won! They have completely won! But do they stop to enjoy the moment or give any credit to their leadership for this achievement? Not at all. They are too busy criticizing the slight imperfections to enjoy the larger victory. The DPP is the establishment now! It needs to learn how to accept and enjoy winning. It needs to stop thinking like idealist, perfectionist activists and start thinking like pragmatists. Tsai took a lot of heat from the true believers over the international court’s decision on the South China Seas. They seemed infuriated that she had not taken the opportunity to renounce ROC claims to the nine-dash line, the various islands, or whatever. Personally, I couldn’t care less about all those islands way out in the ocean far away from Taiwan, but I thought her “conservative” stance showed considerable restraint. In a sense, this was showing that her promise to respect the “constitutional order” has real meaning. It doesn’t only constrain her from doing things that ardent Chinese nationalists want (ie: unification with no reference to public opinion), it also constrains her from doing things that many ardent Taiwanese nationalists want (ie: renouncing all commitments made and positions taken by the KMT regime). I don’t know whether Beijing was taking note, but they should have been. That this sort of message could be sent using “disposable” assets made it all the better. Taiwan actually has security interests in the Daioyutai and Pengjiayu Islands, so it might need to be more careful in how it treats those territories. On public opinion, everyone is clearly overreacting. 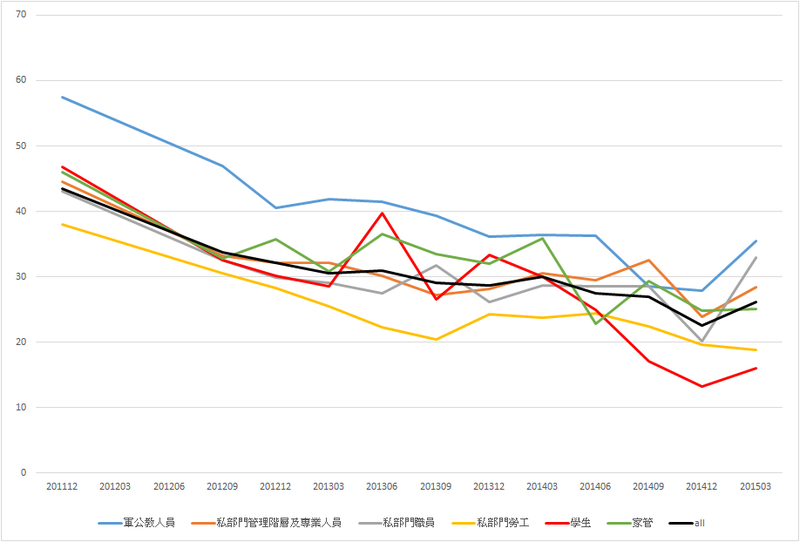 Tsai and Lin’s aggregate approval ratings have declined a bit from their initial levels. However, those initial approval ratings in the 70s were always unrealistic. Those were classic honeymoon numbers. Once normal partisan politics kicked in, a certain number of those people who have never liked the DPP were inevitably going to discover that she was doing DPP-type things. It’s not as if her current numbers are terrible. An approval rating of somewhere around 50%, give or take 5%, is a perfectly workable number. By all appearances, she is mostly holding her coalition together. It looks to me as though the green voters who are dissatisfied are mostly the deep green ideologues who sure as hell won’t be defecting to the blue camp. Moreover, there is another number that isn’t getting near the attention of the satisfaction ratings but is far more important. Party ID is trending in favor of the DPP. During the first three years of Ma’s second term, the KMT hemorrhaged support while this DPP gained identifiers and eventually passed the KMT. By the end of 2014, this trend had played out, and party ID was fairly stable between the December 2014 mayoral elections and the 2016 presidential election. 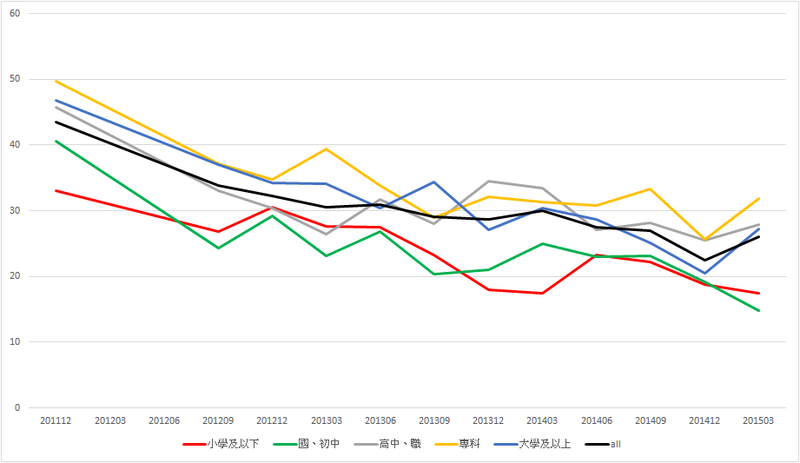 However, in the past six months, the lines have started moving again, with the DPP stretching its party ID advantage over the KMT to unprecedented levels. 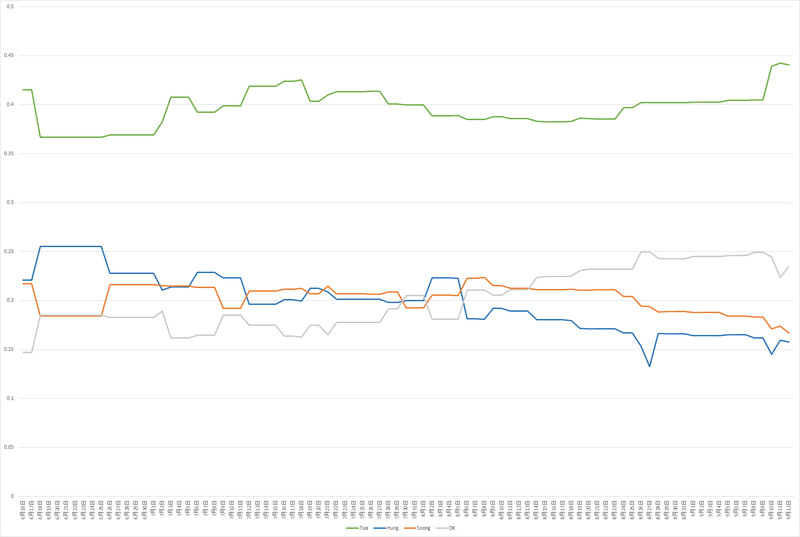 At the beginning of the year, the DPP usually had a 5-10% edge; now that edge is around 20% in most polls. This is hardly a sign of a presidency in collapse. So, hey, try something different. Just chill. 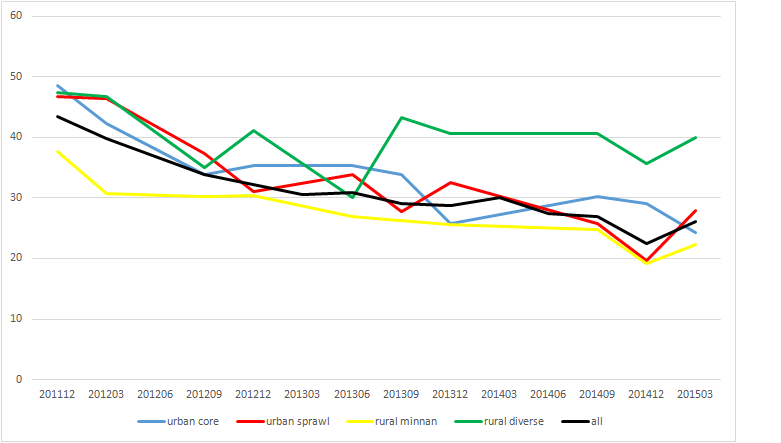 Taiwan was in ultra-politicized/crisis mode almost constantly between September 2013 and January 2016. Try to enjoy a few months, maybe even a couple of years, of more normal, relatively boring politics. Go take a bike ride or hike a mountain or something. Just stop panicking. As loyal readers know, I’ve been a bit out of the loop for a while. It seems as if the only really important thing to have happened in the last couple of weeks was China’s military parade and the accompanying kerfuffle in Taiwan over whether it was appropriate for various people to attend. What kind of effect might that have? In the USA, Real Clear Politics and fivethirtyeight.com (starring Nate Silver) frequently publish polls of polls. That is, they take all the recent polls and average them together. I thought I’d try doing this. I got my raw data from the wonderful volunteers who edit the Wikipedia page on the 2016 presidential election. Please note that I am including all the polls from Wikipedia without making any judgment about their accuracy. Each poll was weighted according to its recency, with a half-life of 7 days. That is, on the day it was finished, it got a weight of 1.00; on the 7th day, it got a weight of .500; on the 14th day it had a weight of .25, and so on. I dropped data when the weight dropped below .05, which happened on the 31st day. It only took me about 3 hours to figure out how to do this, so don’t expect this chart to be a daily feature on my blog. Anyway, here is what the 2016 presidential race has looked like over the past three months. This chart smooths things out quite a bit, but the basic outlines are quite clear. 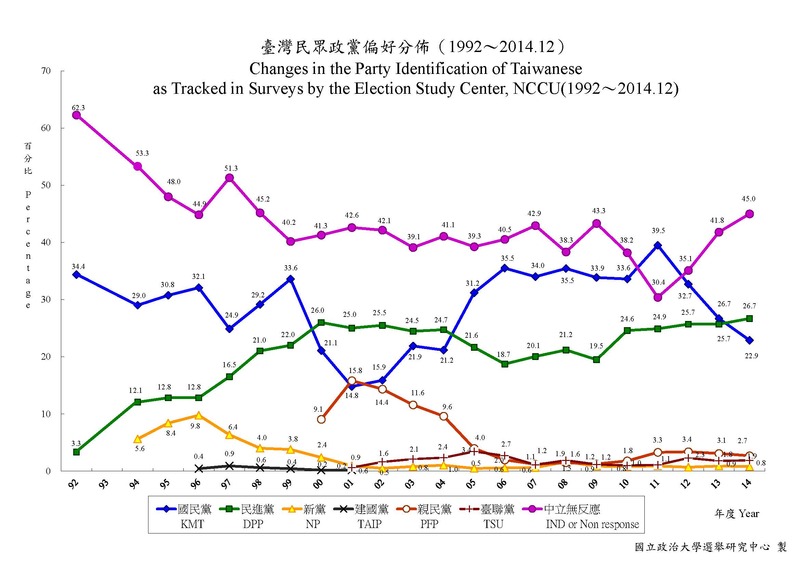 Hung passed the KMT’s polling primary on June 13, right at the beginning of this time series. That was her high point, and it may have been artificially high. Recall that some green supporters strategically expressed support for her in order to ensure that the KMT nominated a weak candidates. Hung was duly nominated on July 19, but her support had already started eroding. 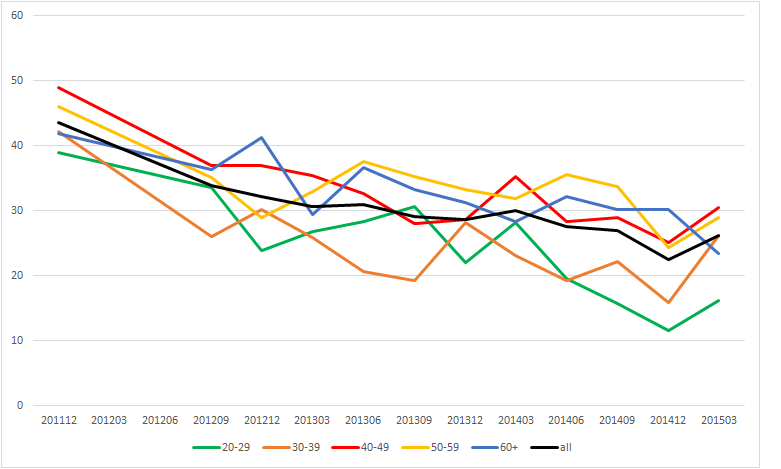 By this chart, she has been steadily drifting downward for three months, and while the pace of her decline has slowed, she is still going in the wrong direction. Soong announced his candidacy on August 6, and he immediately opened up a clear gap between himself and Hung. However, in the past two weeks Soong has also been trending downwards, and he doesn’t seem to be very far ahead of Hung at this point. In the past few days, three polls have shown Tsai Ing-wen opening up a bigger lead. 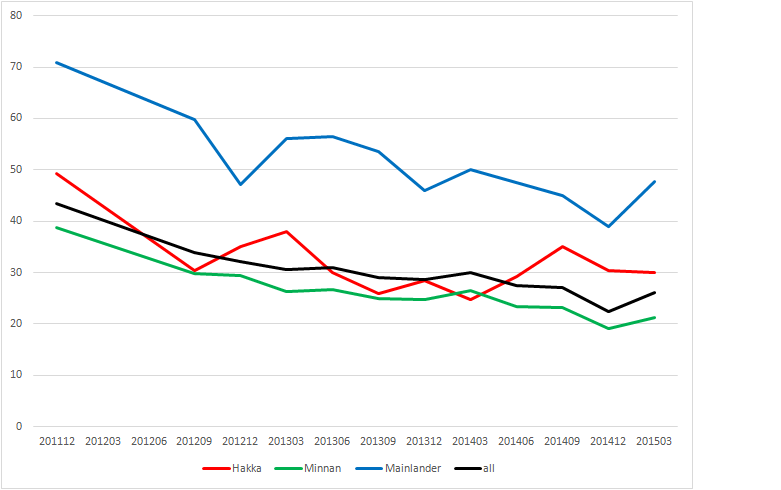 At this point, Tsai is further ahead than she has been at any point since mid-June. In fact, biggest competition is from “don’t know,” which is well ahead of both Soong and Hung. It hasn’t been a good summer for the blue side of the spectrum. You are currently browsing the archives for the public opinion category.